Custom Window Screens. Window Fly Screens By Bravo. Complete Insect Protection. 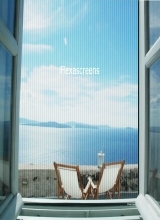 Flexascreens are ideal for your windows. At Bravo, we manufacture custom screens. Our custom manufacturing ensures they will fit perfectly, every time. Our products will ensure that you have optimum insect and bug protection, superb air ventilation capability, ease of installation and affordability. In addition, our products have a tight seal, so there are no openings or the chance that it will become dislodged or blow off. These are some of the reason why Bravo makes is the number one choice for your window screen. The Flexascreens are the 'authentic' flexible insect and bug screens. We use only the highest quality materials combined with superior craftsmanship to produce an excellent product. We have several options to choose from when ordering your products. One option is mesh fabric. There are three options - reinforced fiberglass mesh, solar coated fabric mesh or pet proof / pet resistant fabric mesh. In addition, you can choose from black or white for your Velcro fastners, to ensure a better blending. Our window fly screens are manufactured to ensure durability and longevity when protecting your doors and other openings. We want you to be able to trust Bravo products as being the best on the market. Our custom window screens are made with a specially formulated vinyl-coated fiberglass to help to ensure lasting color and flexibility. Bravo screening mesh is stiffer than regular fiberglass mesh. Our mesh provides the greatest visibility through your screens, with no obstructions of your views. Therefore, you will hardly even be aware Flexascreen is there! Bravo uses genuine Velcro fasteners which are securely attached to your screen, so when you receive your products, simply peel back the Velcro at the indicated area and attach to your window frame and press into place! Presto, it is done.